Every June the French Riviera kicks off the summer with a bang at Europe's most highly-anticipated creativity festival of the year, the Cannes Lions. The industry bursts into life as individuals come together to share ideas, be inspired by speakers, and of course, to network. A wise man once said that "an event is only as strong as its networking parties" - and man, was he right! We're not 100% sure who said this, but we are 100% sure that this Cannes Lions 2018 Party List is going to be one of your best friends this year. 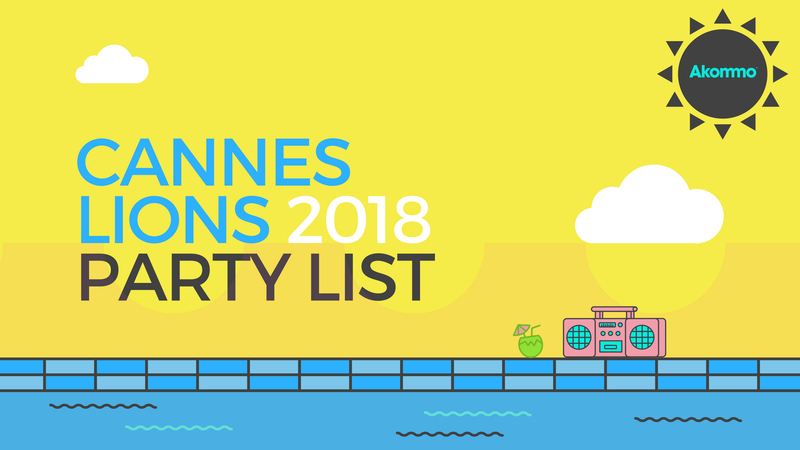 Without further ado, Akommo is happy to present to you with the Cannes Lions 2018 Party List. We'll be continually updating this list until Cannes Lions 2018 is over, so if you'd like to contribute, email us at the address below. Oh, and don't forget to pack your sunglasses and ibuprofen, you animals! - 19 June - 12:00-19:00 - Captify BBQ and Pool Party - Get your ticket or book your meeting here! PS- you need a password to get in, best of luck, friends! Scroll to the bottom of the page to find the email to contact for an invite! - 22 June - 22:00-02:00 - Long Beach Party - Find more information here, and contact a sponsor if you're keen to go! This annual South African party is one you don't want to miss. - 19 June - 19:30- 01:30- The Contagious Villa Pool Party- 1 Boulevard de Strasbourg, Cannes - FULL CAPACITY - sorry guys, better luck next year! And don't forget your swimsuit! PS- DJ Luck & MC Neat are going to be DJing and we're PUMPED. - 20 June - 18:00-21:00 - Featuring special musical guest, Franc Moody! All available spots have been filled for this party, sorry folks! Keep scrollin' down, we've got parties for days. - 20 June - 16:00-18:00 - La Plage Croisette - contact:emma.francis@songtradr.com to request your private invitation. - 21 June - 23:00-02:00 - KCPK Party - Register for this specific party here, and check out their entire agenda planned for the week below! - 18 June - 14:30-17:30 - #likeadutchie - The event is invitation only, but you can register as an international guest here! - 17 June - 18:00-21:00 - Hotel Barrière Le Majestic - Welcome to Cannes Cocktail - By invitation only, so check out details on how to register for this sunset soirée here! - 18 June - 22 June - #YouCannes2018 - Full agenda coming soon! Stay updated with details here, you definitely don't want to miss it! Last year was spectacular. - 19 June - 21:00-02:00- Synergy Chain Investors Club Super Boat Party - Exclusive party for all you cryptocurrency and blockchain lovers out there! Become a member of the club here and find out more information here. - 18 June - 22 June - 13:00-17:00 - Tantor's BBQ Sessions - Get ready for some BBQ and DJ sessions every day during Lions! Registration can be found here, but it doesn't guarantee an entry. 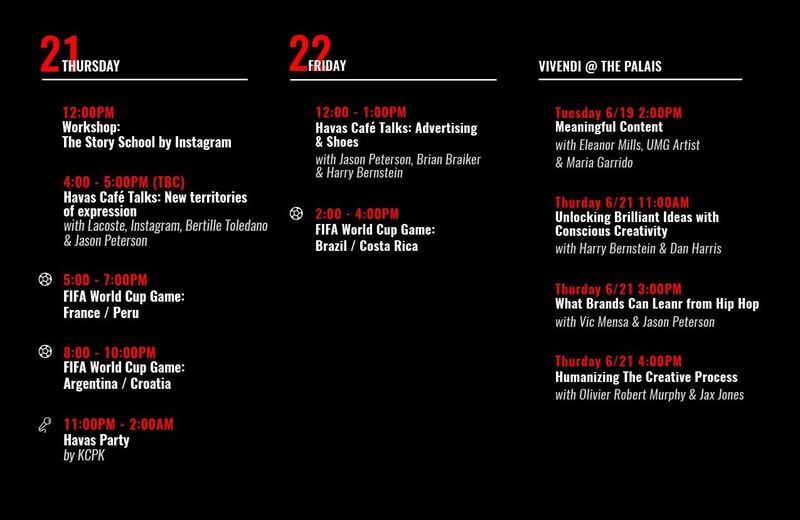 18 June - 12:00-13:00 - Terrasse Talk - Monday Edition with Kim Kadlec, SVP, Global Marketing, Visa and Lisa Granatstein, VP, Content and Events, Adweek. 19 June - 12:00-13:00 - Terrasse Talk - Tuesday Edition with Alegra O'Hare, Vice President of Global Communications, Adidas Originals & Style. - 22 June - 17:00-19:00 - 120 Minute Party - Long Beach - Sign up here to get your pass to celebrate in just 120 minutes! First come, first served! - 20 June - 18:00-21:00 - Cocktails and Connections Party. Invitation only, so fingers crossed that you're one of fortunate few! 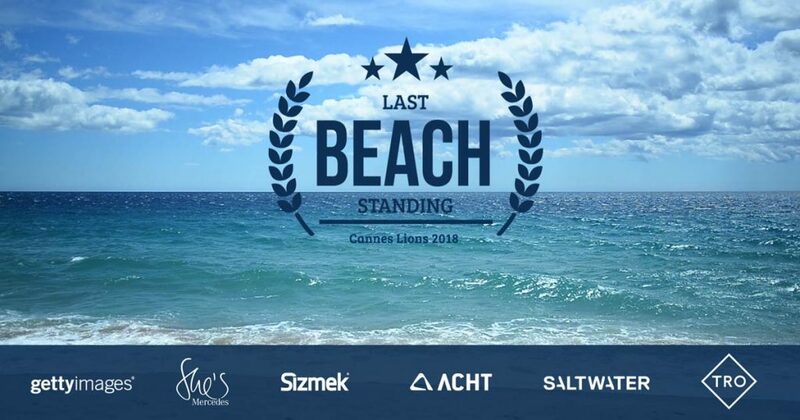 - 19 June - 22 June - 10:30-18:00 - Little Black Book & Friends Beach - La Plage Croisette Beach- Start networking with big names like Adobe, The Network One, Honeycomb, Best Ads on TV, Clear Channel, and many more! There is happy hour throughout the week for sponsors and invited guests from 16:00-18:00 Tuesday - Friday. Click here to get involved. - 18 June - 21 June - Intermittent talks throughout the week - Majestic Hotel Penthouse - Full information not released yet, but click here to register for these powerful talks. - 20 June - 11:00-19:00 - World Cup Party - Le Bénitier Plage- Invitation only, but contact the image in the email below if you want to try your luck and ask for an invitation! - 21 June - 22:00 - 02:00 - Carlton Beach - You can see DJ's Pete Cannon & Uncle Junior playing live for a music-filled evening on the beach! They have reached full capacity for this banger, better luck next year, folks. 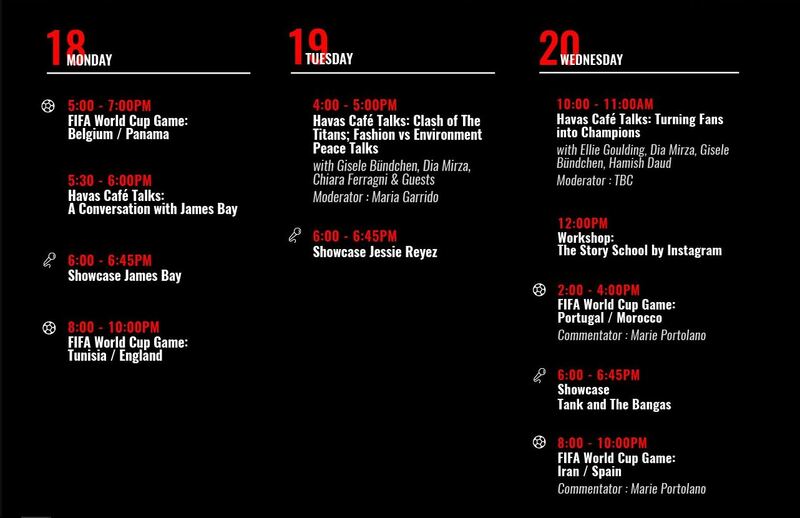 - 21 June - 14:00 - 17:00- Carlton Beach at the AACC Booth, just opposite the Havas Café - World Cup Party for the Denmark v. Australia and then France v. Peru! Sun, sea, sand, and the best World Cup coverage in Cannes with a cool drink in hand. Get your World Cup tickets here! 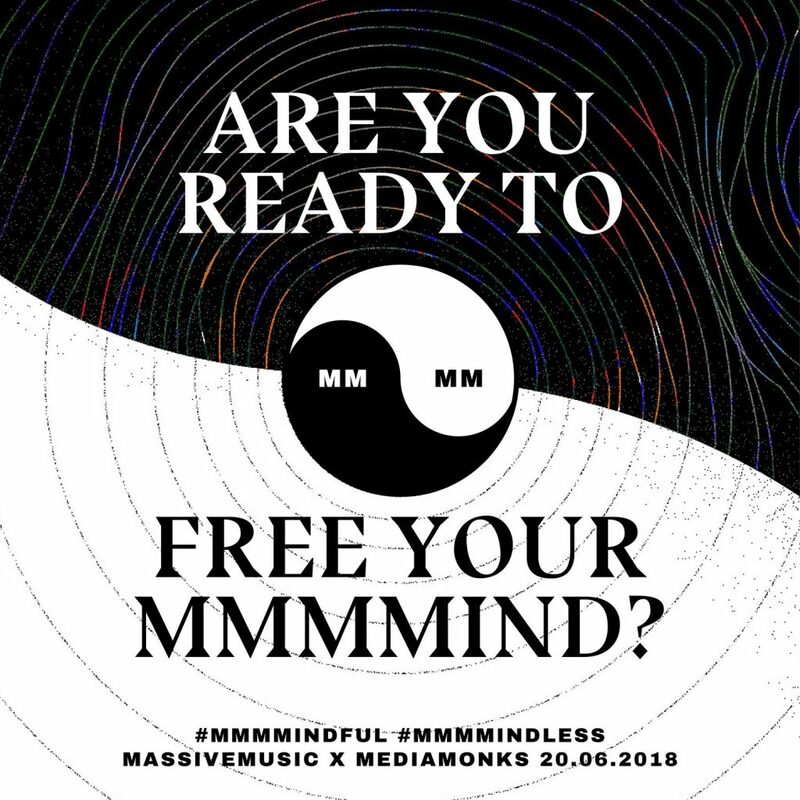 - 20 June - 21:00 - 02:30- Free Your MMMMind - Palais des Festivals - Taking place on the rooftop of the iconic Palais des Festivals, this annual banger is all about the MMMMind. Are you mindful or mindless? Invitation only, but you can find more information here. - 21 June - 19:00- 22:00 - Magic Hour Vol. 4 - Aloha Villa - The Producteur Provocateur group is back for round 4 of sunshine and villa partying in Cannes. Invitation only, mainly for agencies and directors, but you can try your luck and shoot a message to cannes@producteurprovocateur.com. - 18 June - 22 June - 11:00-18:00 - Princess AVK Yacht - All week you can catch some of the most informative sessions on entrepreneurship, blockchain, and not to mention, talks given by Akon! RSVP here for your chance to attend these swanky seaside chats aboard the Princess AVK Yacht. - 19 June - 19:30-02:00 - Sea, Smart & Champagne Party - Hutiane Boat - Calling all global media industry elites! Time to sip some rosé, kick back, and enjoy the good life aboard the Hutiane Yacht. RSVP for pre-registration here, and remember, pre-registration is open until 8 June! - 18 June - 20 June - Weekly activities below all taking place at the MediaMath HQ - 2 Boulevard de La Croisette - Register here! 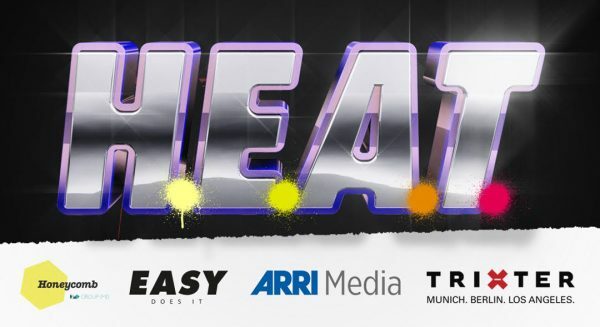 - 20 June - 22:00-02:00 - H. E. A. T. - Croisette Beach - 13 Rue du Canada - Don't miss one of Cannes Lions' hottest parties and feel the heat at this beach party! Invitation only, so hopefully you're one of the lucky ones! - 18 June - 18:00-20:00 - Context & Cocktails - Hotel Le Majestic Solarium- Kick off this Cannes Lions with a cocktail in hand, tapas in the other, and explore contextual intelligence with some of the industry's key players! RSVP here to get your canape on. RSVP here, and follow @TwitterMktg for updates! - 20 June - 17:00- Cuebiq Sunset Rosé Yacht Party- Le Vieux Port Jetée Albert Edouard - Yachts, rosé, sunset... Need we say more? Register for this exclusive Cannes yacht party here. 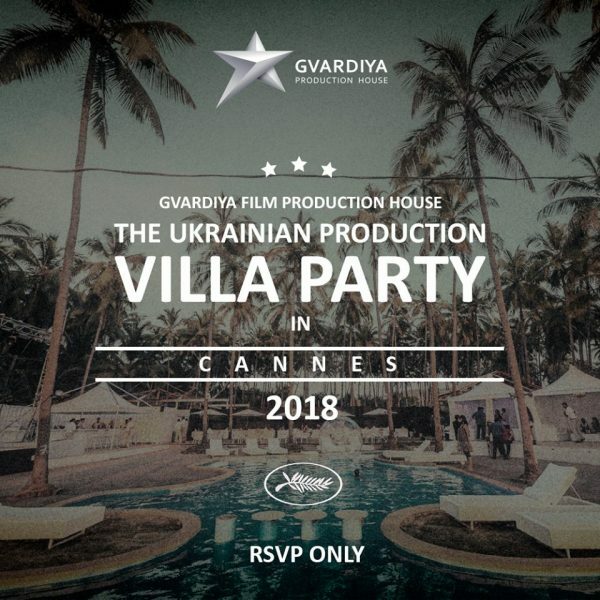 19 June & 21 June - 14:00-19:00 - Gvardiya Production Villa Party- Location TBD - You don't want to miss villa party hosted by Ukraine's famous Gvardiya Production House! They will only share the location after your invitation has delivered, so try your luck and RSVP here! OK, we're gonna be completely honest. If we listed all the activities that The Drum has prepared for you, it would actually take up half of the page. Check out their unreal list of parties and panels here, and cross your fingers for a spot on their list! Hats off to The Drum, they've got a solid lineup for Lions 2018. 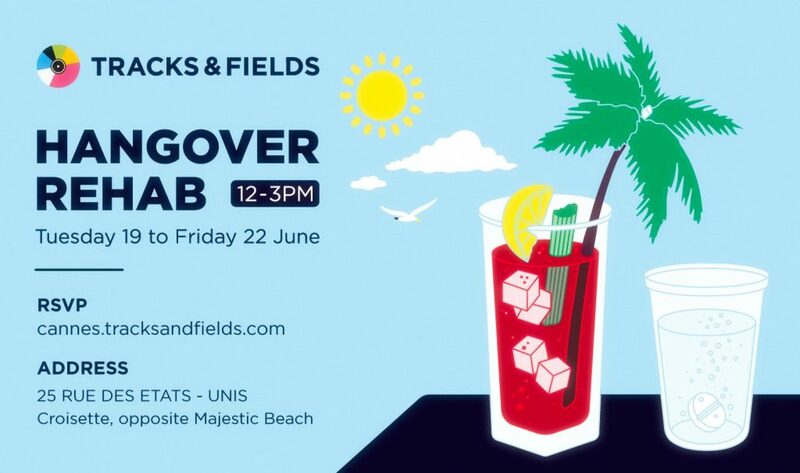 - 19 June - 22 June - 12:00-15:00 -Hangover Rehab - 25 Rue des Etats Unis - Tracks & Fields think of everything, including your impending hangover. Aren't they the best?! And what better cure than a bloody mary or brunch buffet with views of the sea from their beachfront balcony? RSVP here to recharge and refuel after a long night of responsible drinking. - 19 June - 21:00 - Now & Next Party - Plage Long Beach - We all remember last year's party and how epic it was... Word on the street is they're quite determined to outdo themselves this year. This is definitely a party you don't want to miss, friends. Request your RSVP here, and cross your fingers for good luck! 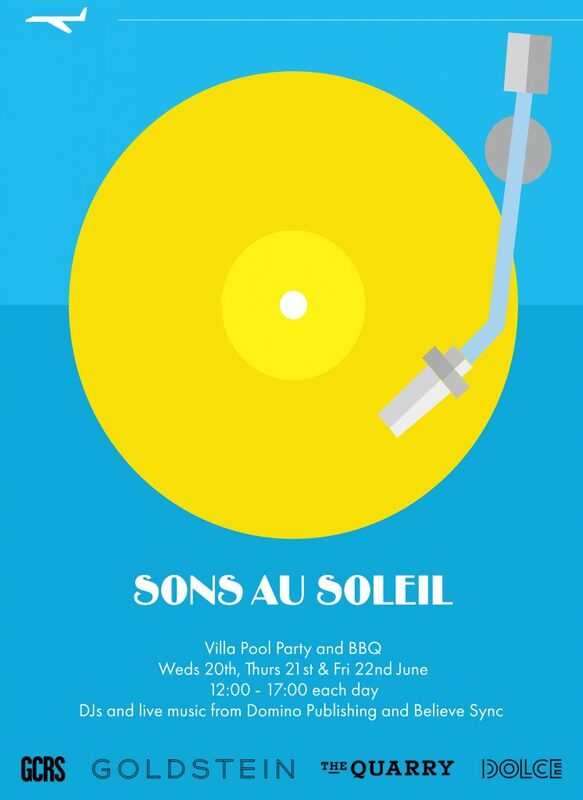 - 20 June - 22 June - 12:00-17:00- Sons Au Soleil - Mougins - 3 Day Villa Pool Party BBQ, DJs and Live Music from Domino Publishing and Believe Sync! This party is going to be filled with fresh beats, drinks, and even provides free transportation for you from Palm Beach Cannes to Mougins if you make it on the invitation list! RSVP here, and we wish you the best of luck as spaces are limited! 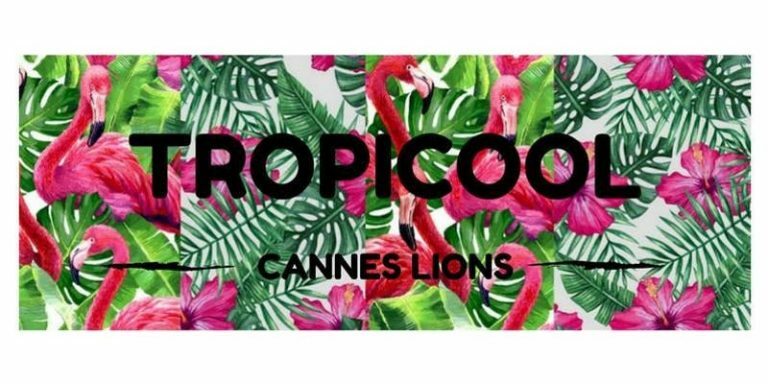 - 20 June - 11:55-04:30 - TROPICOOL - Play Club Cannes- They're back! For the 4th year in a row, to have Cannes Lions' coolest late-night party. RSVP here and be sure to get your wristband! - 20 June- 22 -June - 11:00-17:00 daily - Rado Plage- The lineup of hosts for this highly-anticipated party is impressive to say the least. Meet with top players such as She's Mercedes, Sizmek, Acht, Saltwater, TRO, and more. Sign up here by scrolling to the bottom of their page! 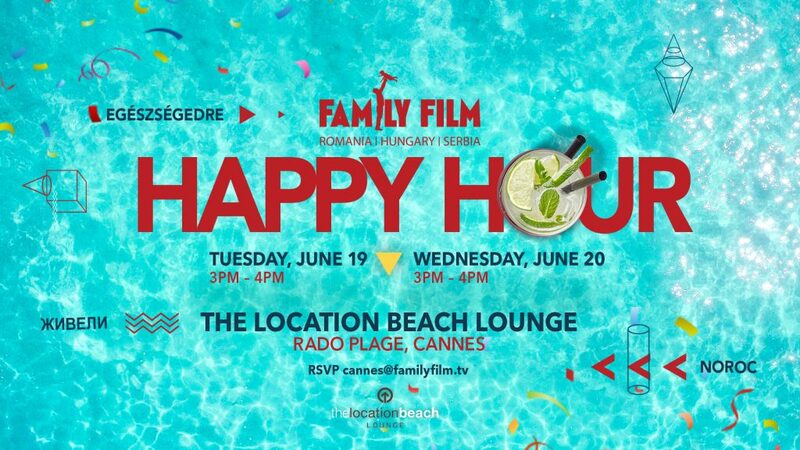 - 19 June - 20 June - 15:00-16:00- Family Film Happy Hour - Rado Plage Beach Location Lounge- In between chats, discussions, and meetings, pop over and say hey to the friendly Family Film TV- drinks are on them! RSVP by emailing cannes@familyfilm.tv. 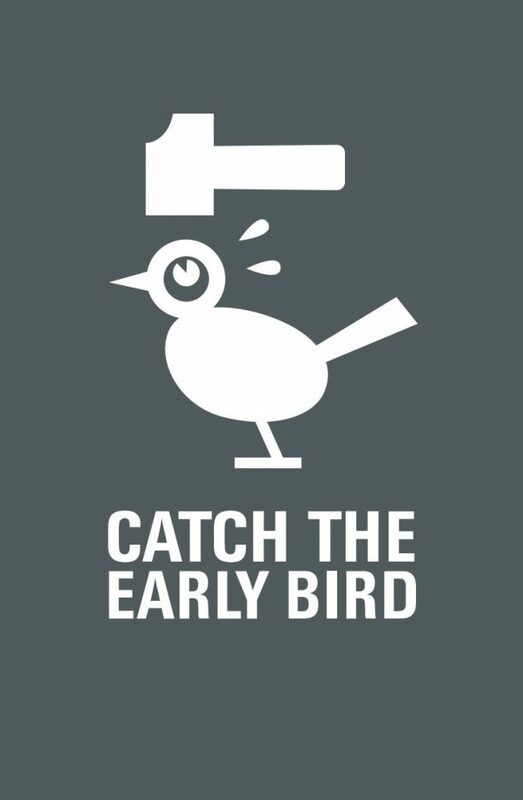 - 23 June - 8:00-10:30 - EARLY BIRD - Majestic Beach - For all you early morning risers and fitness freaks, this is the party for you. This Early Bird beach party will provide invited guests with breakfast, music, and, wait for it... WAKE BOARDING. Invitation only, but try writing to earlybird@helliventures.de and you might be in with a shot! - 20 June - 8:00 - 10:30 - Women at Work Breakfast - Hotel Martinez - The SHEroes at IPG are teaming up with the Women's Leadership Network and featuring female speakers from companies like Amazon, The NY Times, Facebook, BBC, and more to inspire and motivate. RSVP here, but don't show up fashionably late - you won't want to miss this. 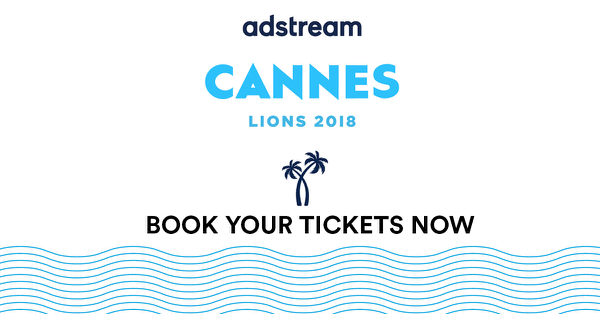 - 19 June - 11:00-13:00- Video Everywhere- Yacht Panel 1 Jetée Albert Edouard- See how brands, publishers, and agencies will all come together to reach consumers on all digital screens...on a yacht! RSVP here for this informative and exclusive panel with Digiday and Teads. 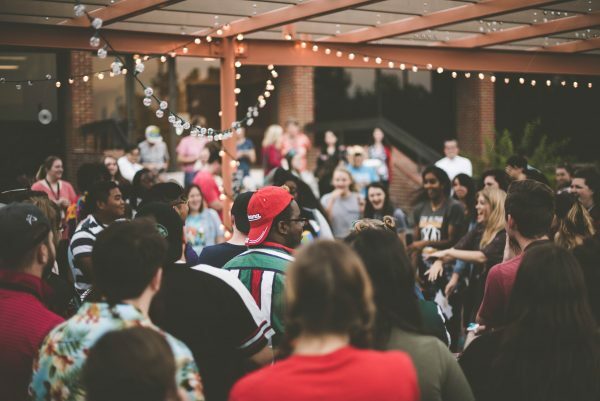 - 20 June - 17:30 - 20:30 - Pioneers Party - Contagious Villa, 1 Boulevard de Strasbourg - Join the bravest agencies on the planet at their annual Pioneers Party! You'll have a chance to meet the Contagious co-founder, Paul Kemp-Robertson, and take part in Getty Images' interactive sessions to see what visuals your customers are engaging with. Register here and prepare to be entertained. 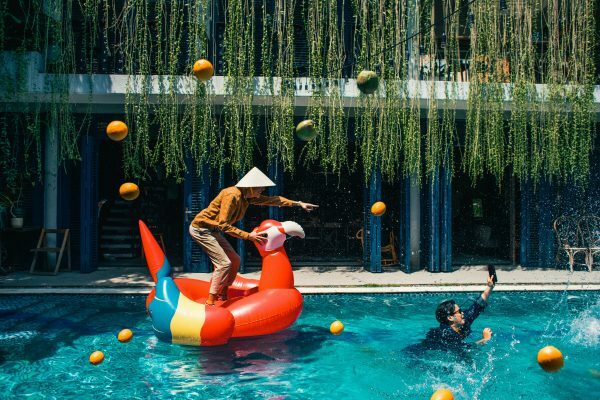 - 20 June - 15:00 - 20:00 - Adbotic Pool Party & BBQ - Adbotic Villa, 25 Route de Village - Join the creatives at Abdotic for some drinks, a BBQ, swimming, and some light conversation about online advertising. Registering doesn't guarantee entry, but sign up here and wait in breathless anticipation for an RSVP confirmation email. - 18 June - 16:00 - 18:30 - Double Verify + Taboola Happy Hour - Cabanas 12-17 Boulevard de la Croisette - Starting off this Lions with a cold drink in hand, warm ocean breezes, and live music on a beach cabana doesn't sound too shabby, does it? RSVP here and start of your week at Lions the right way - with a cocktail, of course. - 19 June - 21:00- Late - Big Ideas Under the Stars - Nielsen Yacht (details if you get in) - This is one of the most anticipated events for Cannes Lions related to data. This yacht party is the place to combine good times and great ideas, so make sure you sign up here. They will have exciting events all week, which you can find here. - 20 June - 9:30 - 11:30 - Dutch Breakfast - Plage Long Beach, Boulevard de la Croisette 50 - The Embassy of Dutch Creativity and FreeForce are teaming up to feed you breakfast and get creative. There will be two sessions, both offering a typical Dutch breakfast of Hagelslag, or white bread with butter and chocolate sprinkles (the reason why Dutch people bike everywhere!). Register here to be Dutch for the morning! 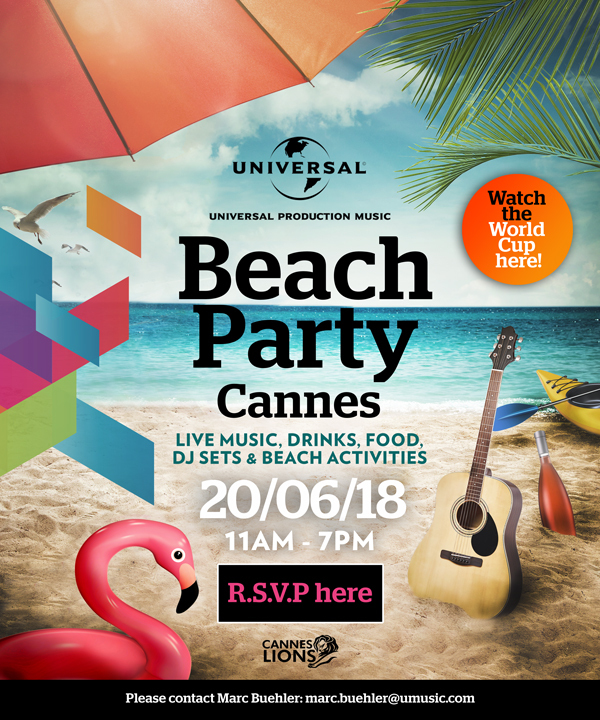 - 19 - 21 June - 12:00 - 21:00 - Cannes Pool Party- Register today and get access to the Limelite Cannes Pool Party by clicking on their link here. - 18 June - 21 June - Daily, from 9:00- 18:00 - Pinterest Pier, 58 Boulevard de la Croisette at the Carlton Hotel - Pinterest is coming to the rescue this year with refreshing drinks, "tasteshops", and an impressive lineup of panelists. Word on the street is they're making the best juices, iced coffees, and even shoes! Some of the events require RSVP and *Cannes Lions Badge* to get in, whereas others are first come first served! Cool off with Pinterest at the Carlton Hotel here. - 18 June -18:00 - 22:00 - Private Opening Night Cocktail Party - Invitation only, for an exclusive group of media and advertising executives to sip champagne and enjoy hors d’oeuvres aboard their private yacht. Join TV Squared and their partners for this swanky yacht party by sending an invite request to Cannes@TVSquared.com and check out their full list of activities here. 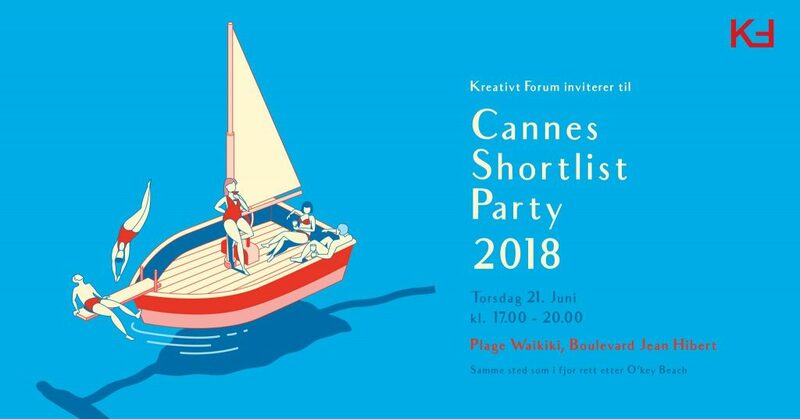 - 21 June - 17:00 - 20:00 - Cannes Shortlist Party 2018 - Plage Waikiki - Get down with the creative NGO Kreativt Forum and celebrate the Cannes Shortlist! If you've never been to Waikiki Beach in Cannes, you've been missing out. See more information on their Facebook page here! - 18 June - 21 June - 10:00 - 17:00 - The Facebook Beach - La Plage Barriére Le Majestic- Facebook is going to blow you out of the water with their festivities next week. Most are on a first come, first served basis - however, some panels and events require the Cannes Lions ID badge. One event asks for registration and they even provide you with a password on the schedule page... Can you find it? - 18 June - 22 June - 11:00 - 15:00 - Daily Events - Cannes Lions Piazza, 6 Boulevard de la Croisette - They will be having daily thought-provoking events for you to attend at the Fiverr Pro Studio! From panels with industry leaders to happy hours, they've got a full lineup of activities for you! - 18 June - 22 June - 09:00 - 18:00 - JustPremium Beach - Majestic Beach, shared entrance with Facebook - Kick up your feet and enjoy a peaceful moment of tranquility while taking in the view of sunny Cannes - high up in the sky! Yes, we said in the SKY. Parasailing, anyone? Sign up for your chance to go parasailing, wake boarding, or even tubing during Cannes Lions here! 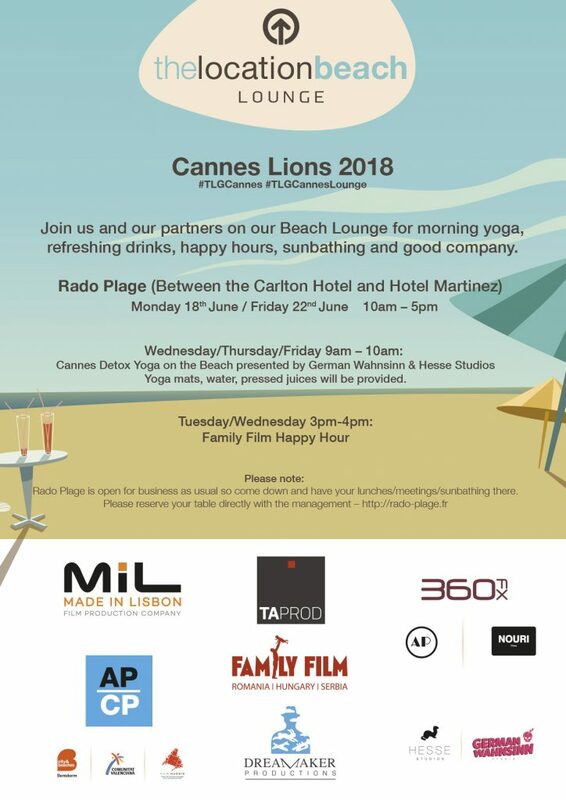 18 June - 22 June - 10:00-17:00 - The Location Beach Lounge- Rado Plage - From a swanky evening soirée on the beach, to morning yoga sessions (mats included, oh yeah!) and detox juices, The Location Guide has all you need at their lounge. All are welcome to walk up and join in on their festivities, however, the soirée is by invitation only. Were you one of the lucky recipients of an exclusive invitation? - 19 June - 18:00- 21:00 - ROSÉ CHALLENGE - Lady in Blue - Le Vieux Port de Cannes - There is never enough rosé, right? Get ready for a little rosé taste test, cocktails and some delicious hors-d'oeuvres in the Cannes Old Port. Sign up here and get ready to indulge in an exclusive evening with Rubicon Project. 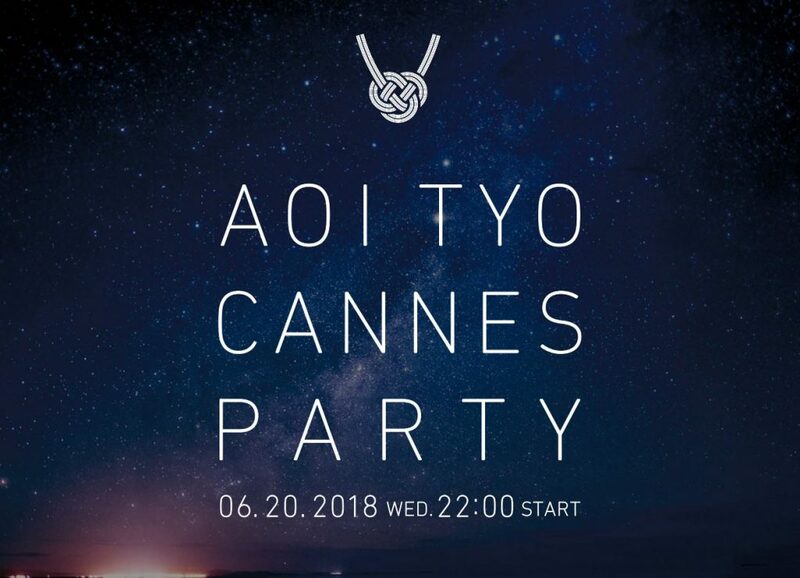 - 20 June - 22:00-late - AOI TYO Cannes Party 2018 - KA Bar- World Food Club, Palais des Festivals - Get a chance to practice your language skills and experience Japanese culture at the AOI TYO party! Admission by invitation only. Arigato gozaimasu! 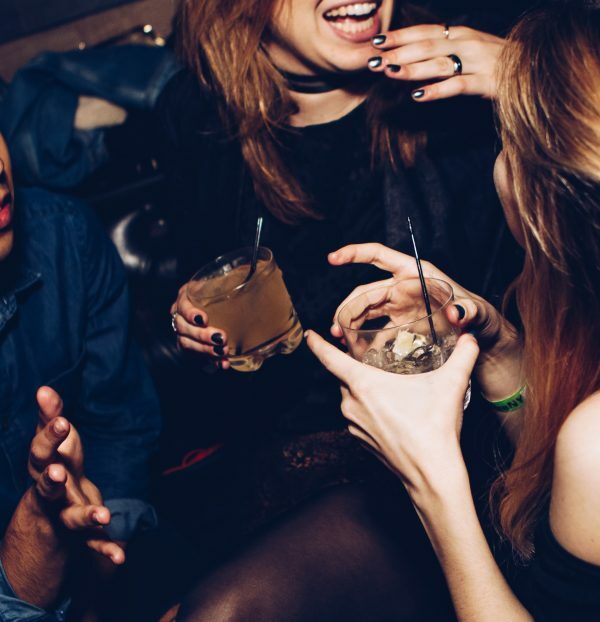 - 18 June - 20 June - Various daily activities - Le Gray d'Albion Penthouse - From Cannes Happy Hour, to the Cannes Blanc Poker Party, to the highly anticipated Cannes Lions After Dark Party, LiveRamp has got a killer lineup this year, which you can find here. - 17 June - 22 June - 12:00 - 21:00 - #GoogleBeach - La Plage Barrière Le Gray d'Albion - Last, but most certainly not least on the Cannes Lions Party List 2018 is... GOOGLE. From thought-provoking panel sessions to week-long Juice Huts, and even a GIF booth, Google has (and knows) everything. Not to mention the daily YouTube Music Sessions with surprise performances by some of today's hottest artists! Click here to start adding #GoogleBeach to your Google calendar. Subscribe to our newsletter and we'll be sure to send you an update every time a party is added to the Cannes Lions 2018 Party List! Our next update will be a surprise - stay tuned! Want to promote your party on the Cannes Lions 2018 Party List? Write to us at: contact@akommo.com with the details of your party and let's chat! Special thanks to our friend Ailton Henriques for helping out with the creation of the Cannes Lions 2018 Party list - you are a (creative) genius!